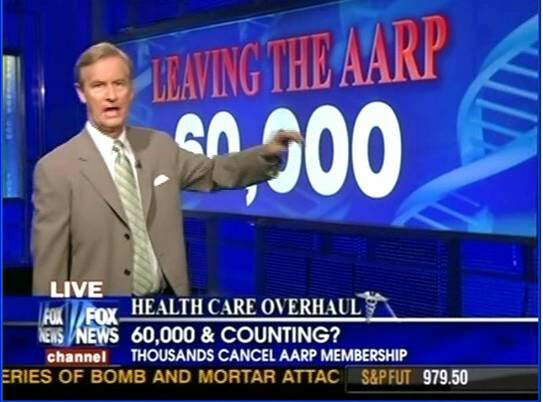 Fox News is reporting that American Association of Retired Persons (AARP) has lost 60,000 members since July 1, 2009. Keep reading to see why the following claims are BS. Fox News’ Van Susteren: “Sixty thousand senior citizens have bolted AARP.” On the August 18 edition of her Fox News show, Greta Van Susteren stated: “They’re out — 60,000 of them. Sixty thousand senior citizens have bolted AARP since July 1.” She then interviewed an AARP member who stated that she is planning to quit the group because of her views on the AARP’s position on health care reform. There are two sides to every story, and in this case the other side provides the whole truth… Let’s look at the figures, first, regarding membership numbers for AARP to see why Fox News’ claims are misleading. AARP claims that they regularly lose 300,000 members per month due to reasons including death. AARP also gained 400,000 members and 1.5 million members have renewed since July 1. AARP has around 40 million members, making that 60,000 a fraction of a percent. Because he is using a factual number to represent something it doesn’t. That is a deliberate attempt to mislead. surely you get that. If your child presented innformation to you in this mannor, you would call it a lie. However, if you consider this good and accurate reporting then you would make a great Fox News follower, or – maybe your simply justifying the deception. AARP has betrayed seniors, period. For over a year they continued sending me membership cards and applications. As a senior who has followed AARP and knows that they supported Obamacare and the gutting of SSI. All because they would profit when seniors needed additional healthcare. YOU PEOPLE ARE EXTREMELY GREEDY AND DO NOT REPRESENT SENIORS. YOU’RE AN INSURANCE COMPANY AND THAT’S ALL. IF I HAVE TO PAY MORE FOR HEALTHCARE. I WILL PAY THE EXTRA RATHER THAN DO BUSINESS WITH YOU. You will note the start of the story was from CBS not Fox, why castigate Fox for reporting what CBS said, then verified by Fox? Fox, in general tends to be fair, balanced and factual compared to NBC, CBS, ABC, NY times and other left leaning media. Several years ago , AARP reported their membership was 55 million. At the time this article was posted, their membership was 40 million, a number that has remained virtually unchaged since then. In these times when Baby Boomers are an increasing number of our population, a loss by AARP, or even a maintenance of their membership year over year, represents a failure on their part. Also – CNN’s Blitzer and MSNBC’s Matthews are reporting the same exact figure. So why are you just bashing FOX? Tina, I assume you followed a link and didn’t type in the URL. Otherwise you may have noticed that the name of the site is FoxNewsBoycott.com – yes, they are all selling the same line of BS. But again, this site is devoted to Fox News, in case you missed it the first time. HANNITY: I think that’s very indicative that they’re losing seniors. I was searching for something on the Fox website and eventually ended up here. However, I most certainly did notice the title, the first time. But I am somewhat confused by your statement. “But again, this site is devoted to Fox News, in case you missed it the first time.” Are you telling me that just plan ‘ole folks like me are not to reply in here and that this is exclusive to Fox News Boycott people only? That seems strange. My point was that I found it somewhat unfair to basically refer to one news reporter as not reporting the truth (the way you worded it) when other stations had news reporters using the same figure. I get the misleading part. No need to explain that. We can all see what we chose to see. The Associated Press is offering the exact same number as Fox and CNN. From the AP article: The approximately 60,000 number represents members who specifically cited AARP’s stance on the health overhaul debate in canceling their membership between July 1 and mid-August, (spokesman Drew) Nannis said. Soloman, Yes, the AP article shows the same numbers I pointed out, so how in the world am I incorrect? AARP typically loses a “small percentage” when they support certain issues – this is a tiny fraction of a percent of total membership and much less than the number of members gained during the same period. You conveniently neglect the part about people *specifically citing* the AARP’s stance on reform. When people specifically cite something, it means that is their primary – if not only – reason. Just like Fox is reporting, and you are trying to spin in another direction. I understand what you’re trying to do – you’re attempting to minimize the appearance of damage to AARP, while you believe Fox is attempting to maximize it. The simple fact is that Fox is reporting accurately. Doocy held closer to a ‘hard news’ line, while in the case of Hannity & Greta they opined more after citing statistical facts. Soloman, You’re just trying to change the focus of the issue rather than focus on the issue itself. The fact remains that the 60,000 members lost is less than the 300,000 it loses on average every month, is less than the 400,000 new members they’ve gained, is far less than the 1.5 million renewals and is .15% of the 40 million total members. If Hannity, Greta & others focused on all of the data, rather than the *shocking* 60,000 *gasp* people would realize it’s a non-issue. I am sure AARP loses that many members to DEATH each month. I don’t believe these numbers are relevant. I just left AARP for supporting the health care plan in congress. Many of my family and friends have also left. None of them died. If it were not for Fox we would not know about ACORN and the radical appointees of Pres. Obama. Ron, The only, though only somewhat, relevant part of your comment is that you and “many of [your] family and friends” have left AARP. Neat. Good for you. The “[n]one of them died” part being linked to AARP, or this post, are a complete fabrication in your mind. Nobody has said that people will die if they leave AARP, which is what you are insinuating, and that is absolutely ridiculous. And, of course, you’ve parroted completely irrelevant FNC opinions for your final sentence. My husband and I did not renew our membership because we do not agree with the AARP support of the drug program or the health care reform. AARP makes more money selling insurance and would want people to be required to purchase health insurance.